Instead, I enjoyed food made by others, mainly family members…including an awesome chicken noodle soup made by B that was heavenly! Who knew that plain macaroni used as noodles would be so yummy….or so fun! Just prior to the holidays however, I experimented with a new recipe and a new ingredient: chestnuts! So sort of pre-holiday cooking that was sort of related…Chestnuts roasting on an open fire anyone? I was out at one of our local markets to pick up some veggies and I noticed a huge bag of “Italian Chestnuts”. They were shiny, round and a beautiful “chestnut” brown. I had no experience with chestnuts. I had never roasted them or really used them in any way. I was curious, and they were pretty, so I bought a bag. It was this purchase that led me to this chestnut recipe, which I found online. But prior to actually attempting the recipe, I had to research the process of getting the nuts out of the shell! This was a fairly long process, so be sure to start this a while before you plan to make the muffins. First step was to slice an X into each nut. This was the fun part as I used a good-sized knife and found it cathartic to slash at them! Then I boiled them for about 25 minutes. I question the amount of time…I also question the method. 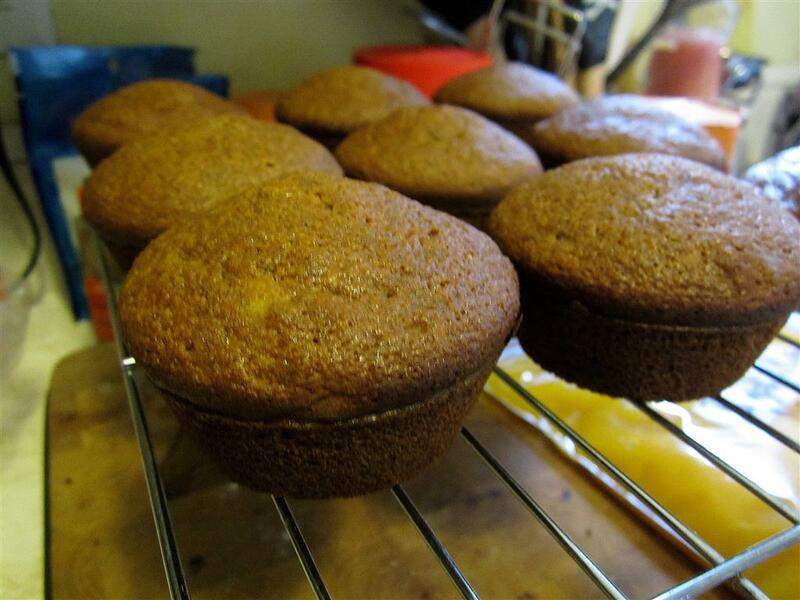 My muffins turned out well, but there were pieces of chestnut that were hard to chew through, if you could at all. They seemed to be overcooked, with the boiling and then the baking. If I were to redo this, I would boil them for half the time, around 10-15 mins and then check to see if the shells were ready to peel. I think 25 minutes was too long. At the end of it, the shells had started to lift and open…as predicted! Everything I read mentioned that the hotter they were, the easier it would be to remove the shell so I started peeling them right away. Most of the shells came off in little strips. It was a messy, somewhat annoying and fingertip burning adventure, but I stuck with it. The shells coming off in strips and in layers of strips was probably the most annoying part of the process. Once the chestnuts were ready to go, I was finally ready to start following the recipe. At this point, pick out 12 nice looking chestnut pieces. You’ll use these to top the muffins just before baking. Oh and also….during the chestnut peeling, I also put my sliced sweet potatoes on the stove to boil. So, on to making the actual muffins! Dry ingredients first…no surprise there…. Wet ingredients mixed secondly…and separate…. I constantly have issues with my butter…although it’s usually my own fault because I have forgotten to remove it from the fridge and bring it to room temperature. So, I end up microwaving it. And it doesn’t matter how short I time span I use, I end up with a severely softened (um..melted) centre and a maybe slightly softened exterior. This explains the picture above and why my butter is in bits. 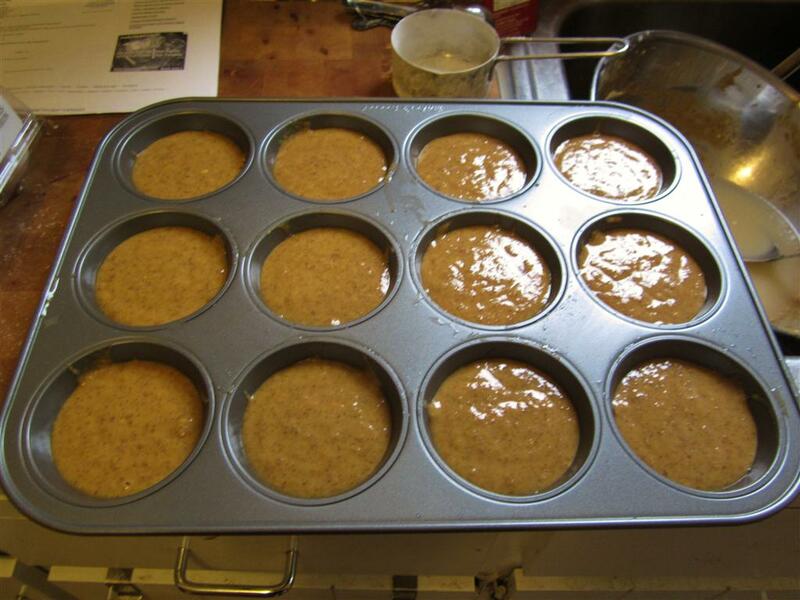 The mixture made 12 good-sized muffins which I topped with a bit of sugar and cinnamon, as well as a large piece of chestnut. 35 minutes later, I had a tray of lovely muffins! 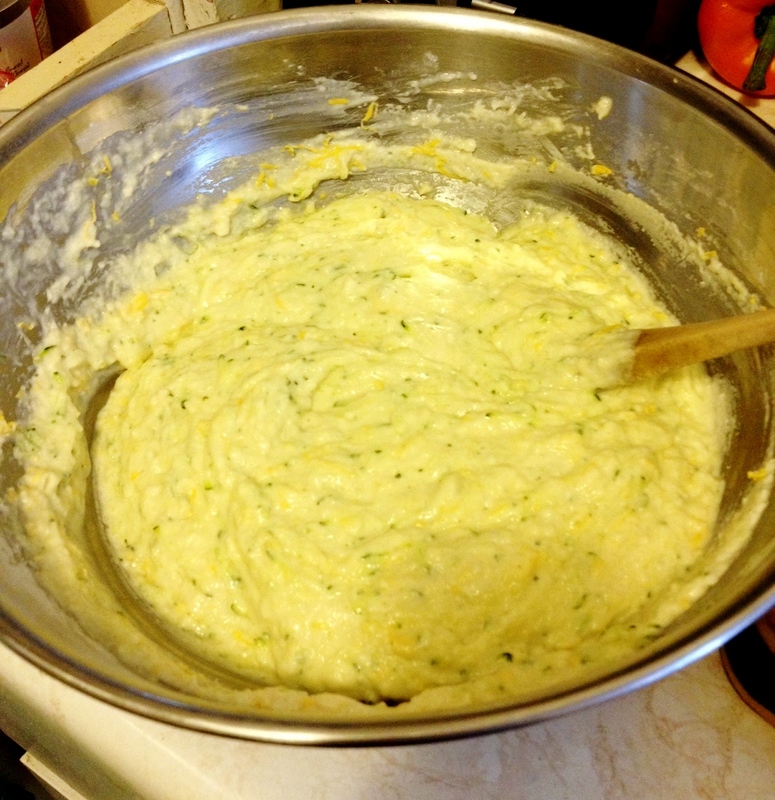 In a medium bowl whisk the eggs, butter, oil, water, and vanilla. Mix the egg mixture into the flour mixture and whisk gently. Add the cooked sweet potatoes, chopped chestnuts and golden raisins. Mix lightly. Sprinkle topping mix on the muffin before baking. Top the muffin with a whole chestnut. 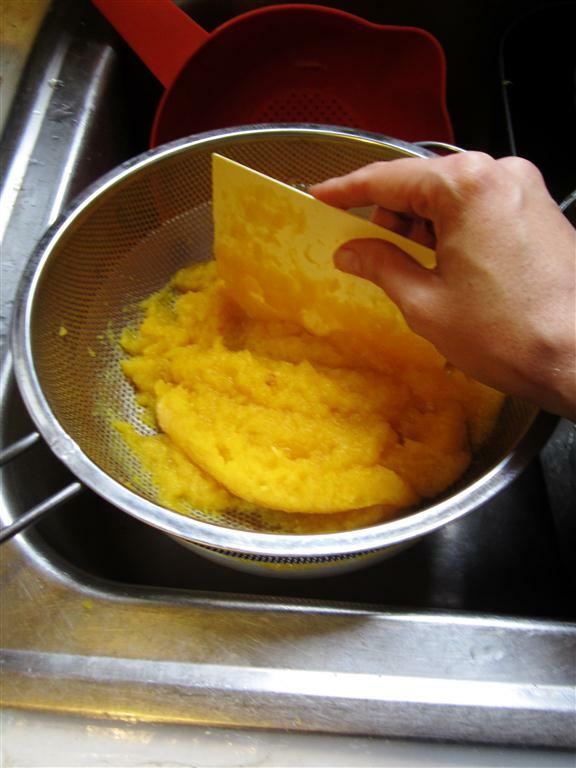 Fresh Pumpkin Puree to Yummy Gluten-Free Pumpkin Muffins, in one day! A few weeks before Halloween, I got it into my head that I wanted to do some cooking with pumpkins. Pumpkins muffins were particularly on my mind. In early October, I attended an event with a table of goodies, all made by the attendees. Each dish was posted with the corresponding list of ingredients so people knew what was gluten-free, vegan etc. The pumpkin muffins I had were delicious! So flavourful, moist and tender…so I snapped a shot of the ingredients list! Kinda blurry, but there is it! I spent some time googling those ingredients, trying to find a matching recipe and I came across one that was pretty close, listed at the bottom of this post. 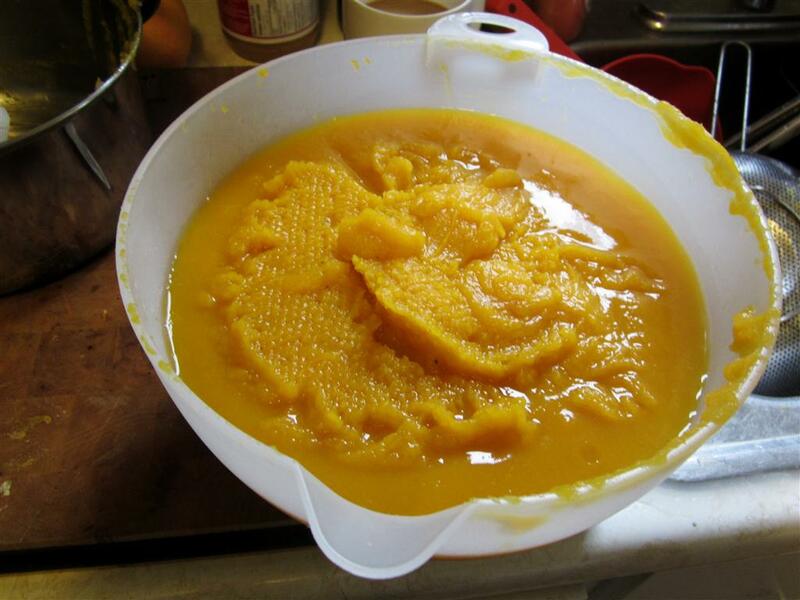 Along with my desire to make pumpkin muffins came my desire to make my own fresh pumpkin puree rather than going to the store and buying the canned stuff. B suggested I wait until just after Halloween, as all the remaining pumpkins would be on sale. Well, not that they weren’t on sale, but the problem was that they were freakin’ hard to find! I scoured my whole neighbourhood…hitting a number of small independent veggie markets as well as the large grocery store nearby. 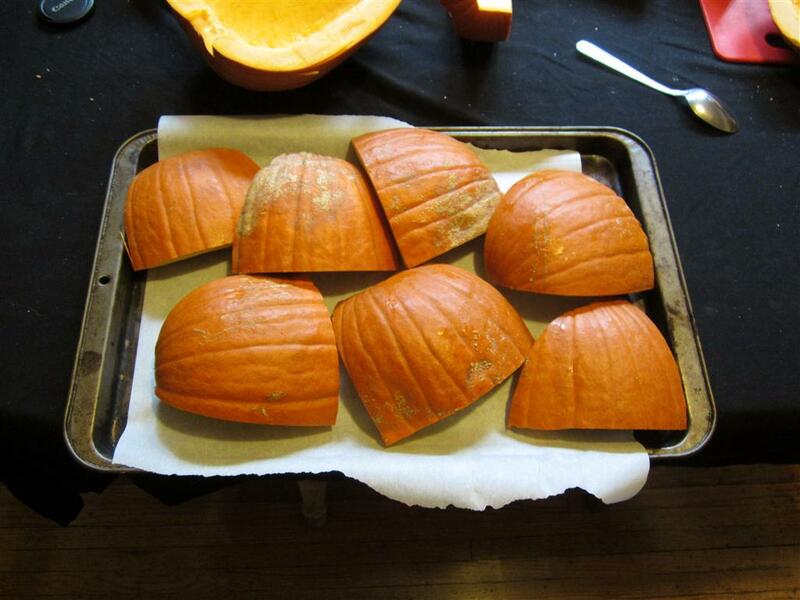 In the end, as I began to consider stealing pumpkins off porches, I came across three of them. I’m thinking they were probably the last three pumpkins in west Toronto! During my pumpkin scouting adventure, I learned the difference between sugar pumpkins and other not-sugar pumpkins. From what I read, it simply refers to the size of the pumpkin. Six to eight inches in diameter is great for cooking. They bigger they are, the less flavour and texture they have. Not surprising. Isn’t that the way with every fruit and vegetable out there? So, I walked home with three sugar pumpkins. Wish I had a picture of that! The ultimate in awkward! 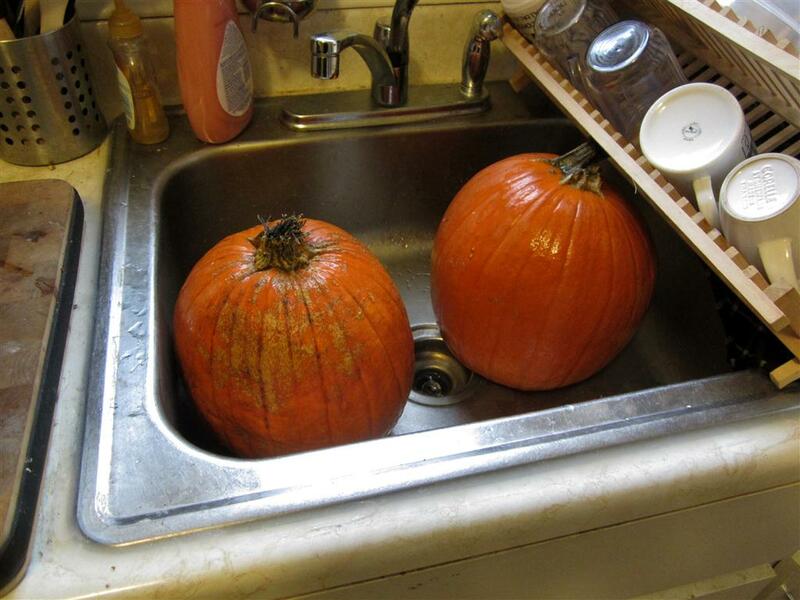 Three pumpkins back to my house, all nicely washed! Okay, two nicely washed. Three pumpkins is difficult. Two is do-able. 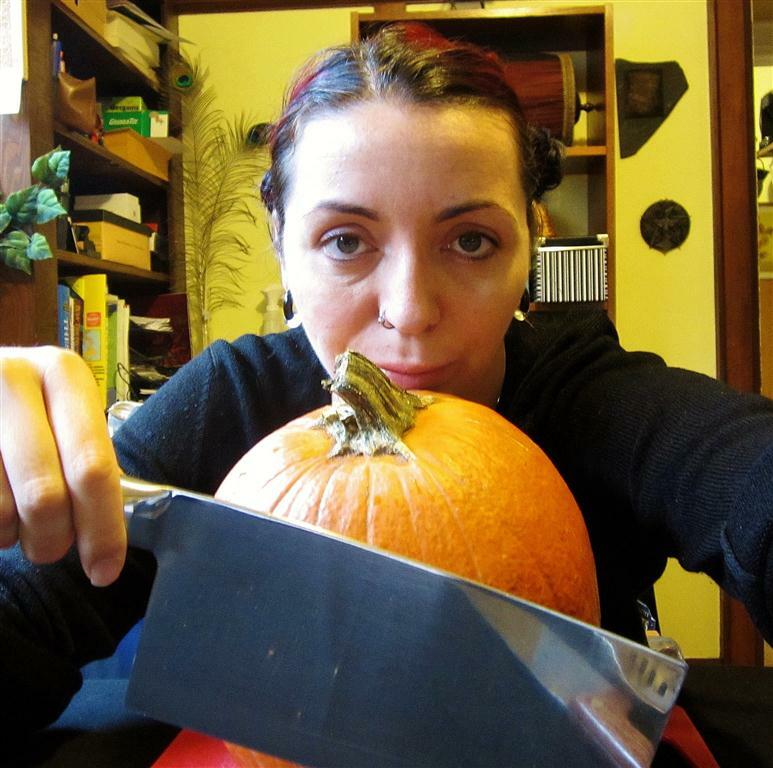 I had done some reading on creating pumpkin puree and one of the most exciting things about it? I had another opportunity to use my cleaver!!! Sssshhhhh, it’s all right. It’ll all be over in minute! Unfortunately, what the websites didn’t tell me was that a cleaver isn’t the best choice for this job! Unlike the rutabaga I cleaved to death in a previous post (*sigh* that was SO much fun! ), pumpkin doesn’t quite work that way. I assume that’s due to the hollow centre. I sadly had to return the cleaver to its hiding place and used a regular chef’s knife to get the job done. It was surprisingly easy to halve them. 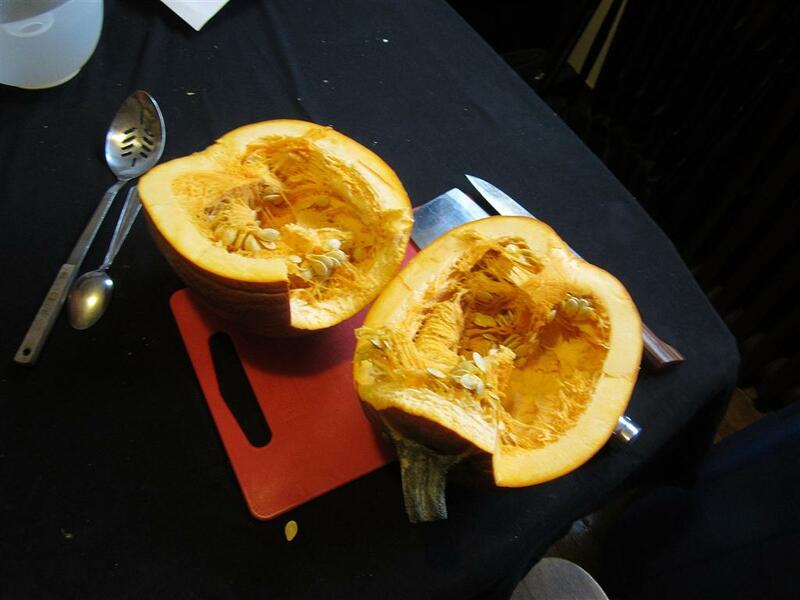 Next up for pumpkin puree, scrape out the guts. Sounds appetizing, doesn’t it? So yes, you scrape out guts. I didn’t keep the seeds. Thought about roasting them. Got lazy. 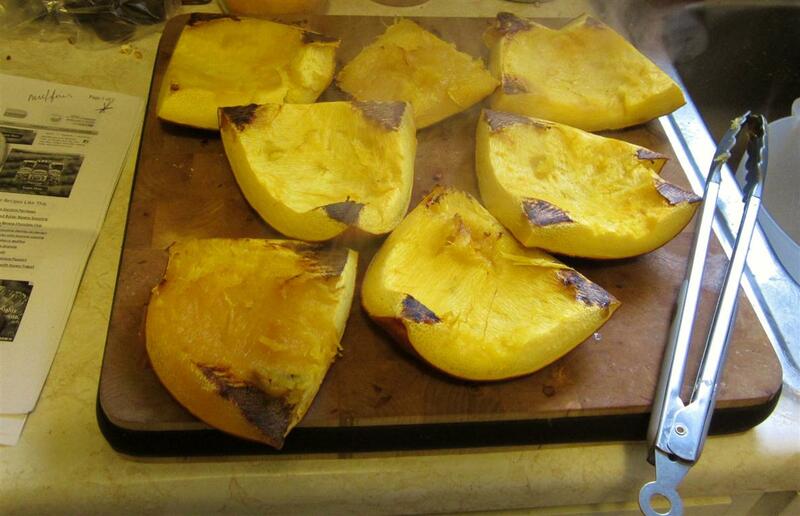 Once scraped clean, I cut my pumpkins into four as they seemed to roast faster that way. I set my oven to 400 F and roasted the pumpkin until it was tender enough to allow a fork or knife to pierce the skin…about 30-45 mins depending. Once tender, remove them from the oven, set them out and allow them to cool, just a bit. It surprised me how yellow the flesh was…and the skins darkened up quite a bit. I removed the overcooked black bits bits and while the pieces were still quite hot, I peeled the flesh from the skin into a bowl. I found that the hotter they were, the easier they peeled. Once I had peeled all of them, I used my handblender to puree the flesh. Then I used a strainer to separate the stingy bits from the purée This took a bit of time but it was worth it to have the smooth consistency at the end. Pushing my purée through a fine strainer. 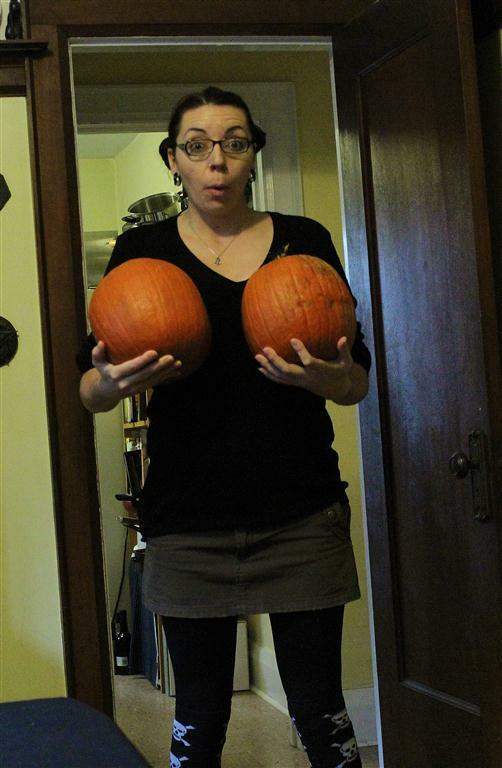 Two 8 inch pumpkins gave me about 9 cups of purée. I used up some and then froze the rest in 2 cup freezer bags. 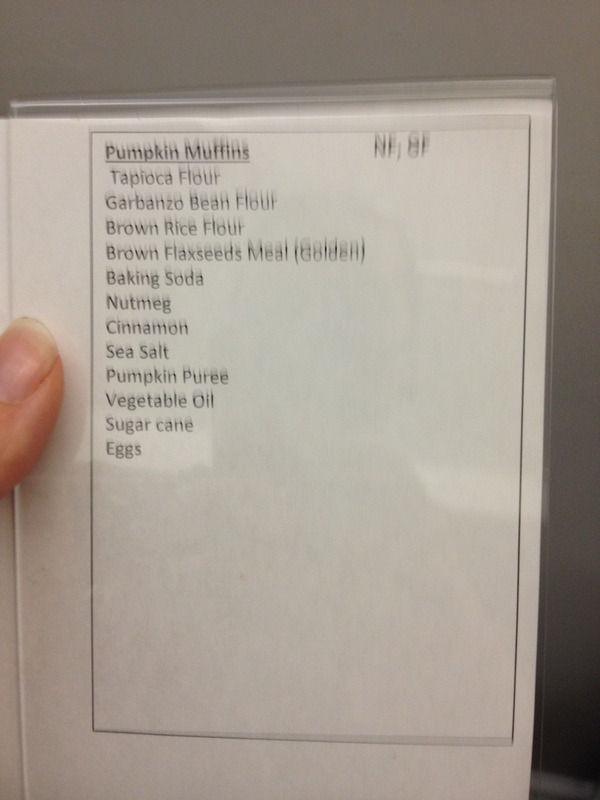 So to finish up this post, I will include my pumpkin muffin recipe! 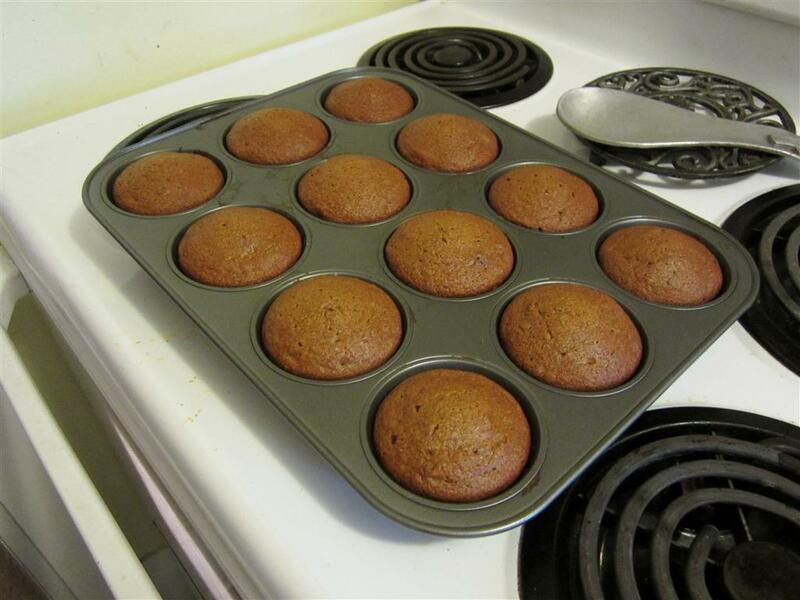 As mentioned, I looked up the recipe online and found it…although I question the measurements as the muffins I made weren’t as soft and moist as the ones I tried in October. Suggestions? What ingredient would you increase or decrease? 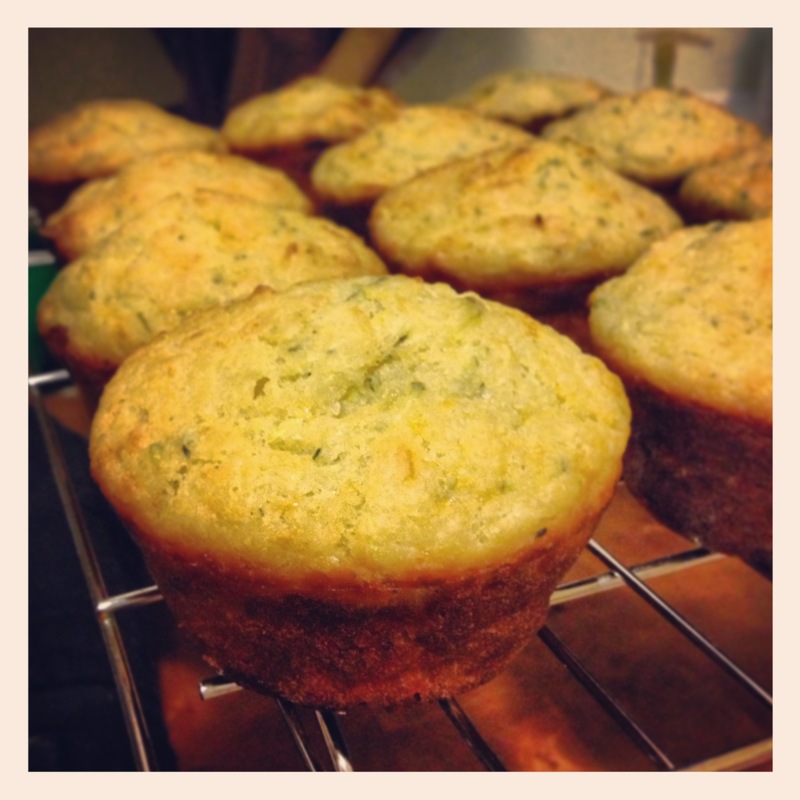 Prior to making this recipe, I didn’t know either of those things…so I figured I’d share. I don’t have much to add regarding the muffin recipe as it’s pretty straightforward. Dry ingredients? Mix. Wet ingredients? Mix. All ingredients? Mix. Muffin tray. Bake. Done. 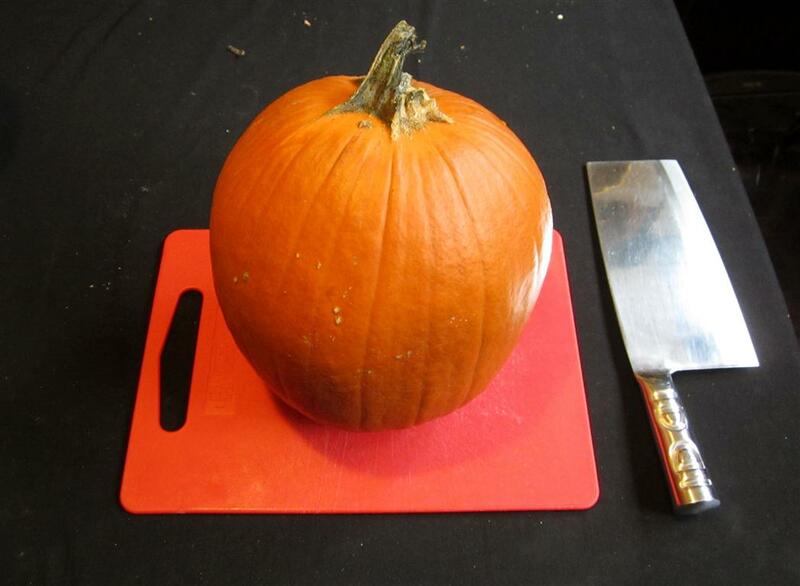 Gather some pumpkins…6 to 8 inches in diameter. 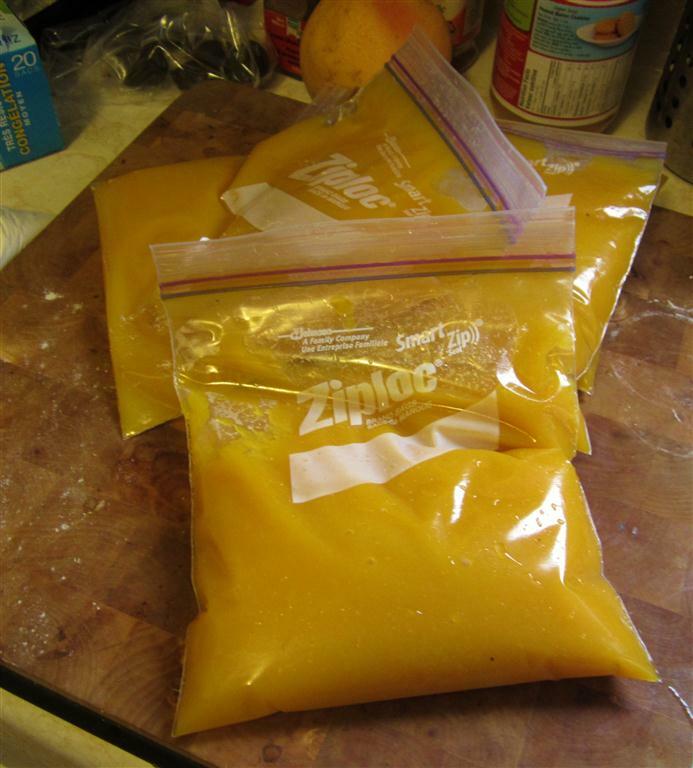 I found each pumpkin created approx 4 or 5 cups of puree. 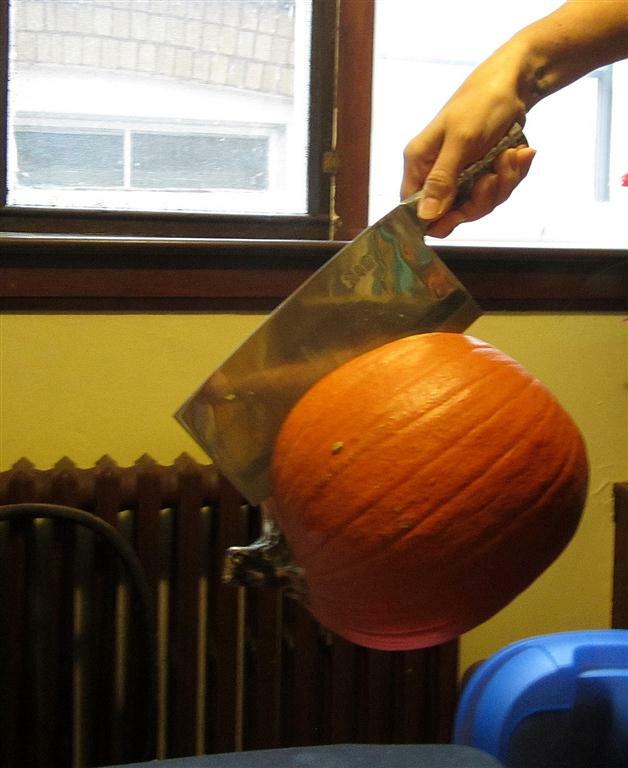 Cut pumpkins in half and scrape out the insides. Then, cut them into fours. Place them flesh down on a cookie sheet and bake for 30-45 mins. The skin will darken and you will know they are done when a knife or fork slides easily through the skin. Remove from the oven and place upright on either the same sheet or another surface. Allow them to cool *slightly*. The hotter you can handle, the easier I found it was to peel away the skin. But be careful and don’t burn yourself! Gather all the flesh into a large bowl and go at it with a handblender (or a food processor if you have one). For a smooth purée similar to the canned texture you can purchase, use a strainer and separate the puree from the stringy bits. This will probably take a little bit of time but I found it well worth the effort! And there you are! Fresh pumpkin purée! The first time I made it, it took a few hours as I didn’t quite know what I was doing. Mix wet ingredients together in another bowl and then add to dry ingredients, stirring just until combined. Ladle mixture into a muffin tray and bake for 20-25 minutes. The recipe was found on the internet in a variety of places and has been adapted slightly. The website I used for reference is found here.